Wind premiered. But Victorian’s had a slightly different approach. In fact, they had several and thanks to Queen Victoria everything worn had a meaning…mostly a depressive, mourning meaning but still a meaning. Queen Victoria reigned from 1837-1901 and is considered to be one of the (if not the) greatest monarchs in British history. Since the monarchy were considered the height of fashion, the people acted like lemmings to the cliffs of death following every bustle, hairstyle, and color palette with which the monarchy wore proudly and (in some cases) not that fabulously. And since Victoria was a lovely 18 years old when she became queen and her reign was the longest (so far…there is a pool going!) in British history, she certainly had a tremendous impact on fashion, art, and music. And when I say impact I mean that she slapped it in and out of shape depending on her mood. 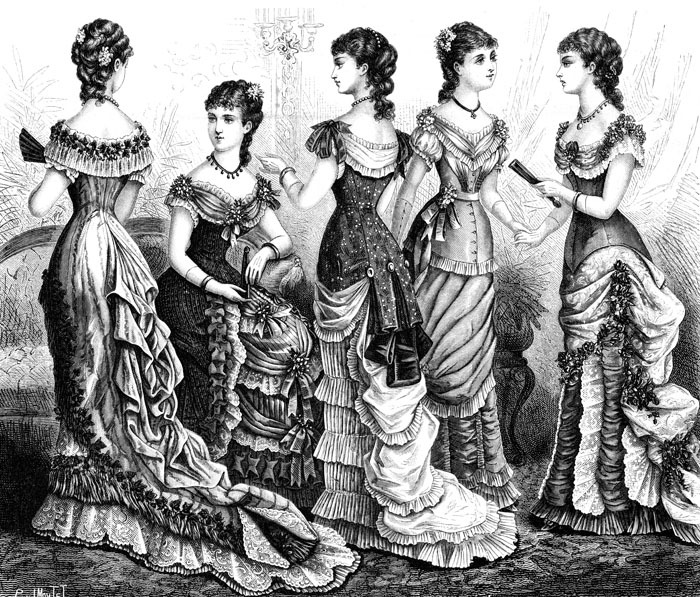 At the start of the Victorian era most fashions lasted about a decade so it is fairly easy to pinpoint the subtle change in fashion during this time. For starters the once popular Gigot sleeves (a very poofy sleeve that was supported with crin) had sagged down to shape the new style of sleeve with which started early Victorian style after the crin had lost it’s stiffness. Elegance and demure were in fashion so bonnets replaced the large hats of the Romantic period and soft ringlets accentuated the face. By 1840, the large sleeves were replaced by form fitted long sleeves which matched lovingly with the boned corsets which flattered a tiny waist. So to recap, a early Victorian lady would have been a walking circus tent with a little bonnet and puffed out like a cream puff…got it! As skirts became wider into what is known as “hoops” the amount of fabric needed to maintain a lovely dome shape was becoming for too heavy. (now we all know Scarlet took the curtains down!) So crinoline (a stiff horse hair woven fabric) replaced the multiple layers to give that extra oomph to the skirt. Separating the bodice from the skirt meant the waist could be made even tighter. You see, the thinner the waist, the more attractive the lady. 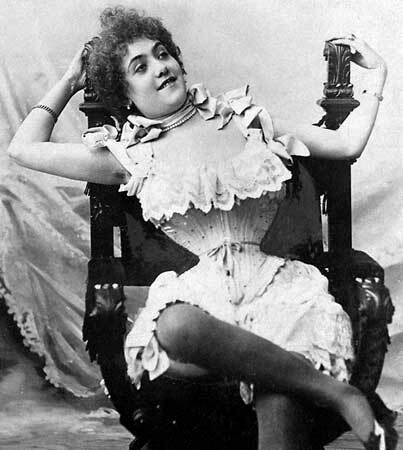 Men even developed fetishes for the fad so the tighter the corset the more amorous the man. This is a really, really disturbing aspect of fashion in this period. I mean, have you see what these things do to you? 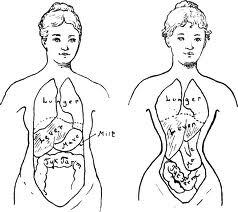 They move the organs around and then mash them permentantly to where you look like the corset even when you’re out of it! And men? What the hell was wrong with you guys? Why did you do it to yourselves? By 1856, a remarkable discovery brought color and life into Victorian clothes! An extract from coal tar called Mauveine which was a bright purple dye synthesized under laboratory conditions and it revolutionized the textile industry. Soon other brilliant colors came, such as magenta, and soon bright colors were in full swing. Now whether or not it was safe…now there is a mystery. Next up…the sewing machine! Yes, this contraption moved things along much faster as garments could be made in half the time and soon would be the start of another first. Couture! 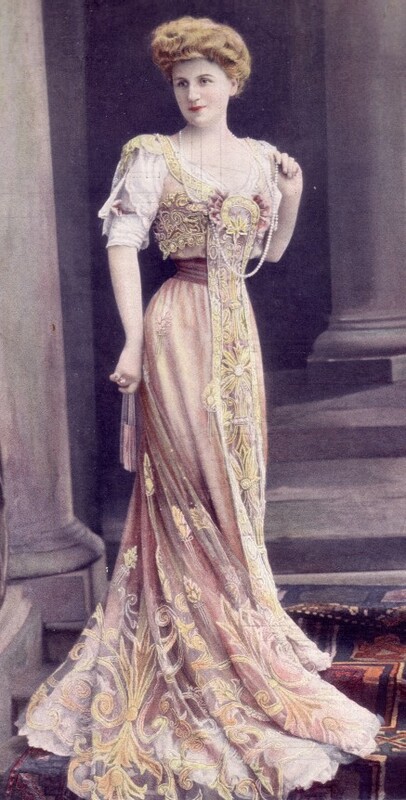 Victorian costumers normally called the shots as to how a dress should be made, cut, colored, and decorated. With the help of the sewing machine, anyone really could become a seamstress and impress upon the masses the need for immediate fashion. Why wait for a new item when it could be at your very fingertips? This, everyone, was the first signs of domestic laziness! Also, the hoop skirt began to loose it’s oomph in the front and basically it move to the back! So you basically have “junk in your trunk”…so to speak. This is given to the design of the Princess dress. Ever seen Jane Eyre? Yeah that movie creeped me out a little too. That would be a Gabriel Princess dress. The dress used lines to accentuate the figure. The normal Princess was not as constricting as the Gabriel version. 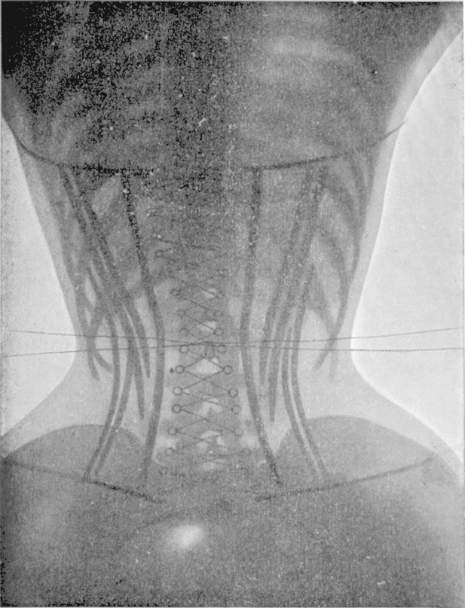 However, let’ continue to see what the corset can do to the human body via X-rays! 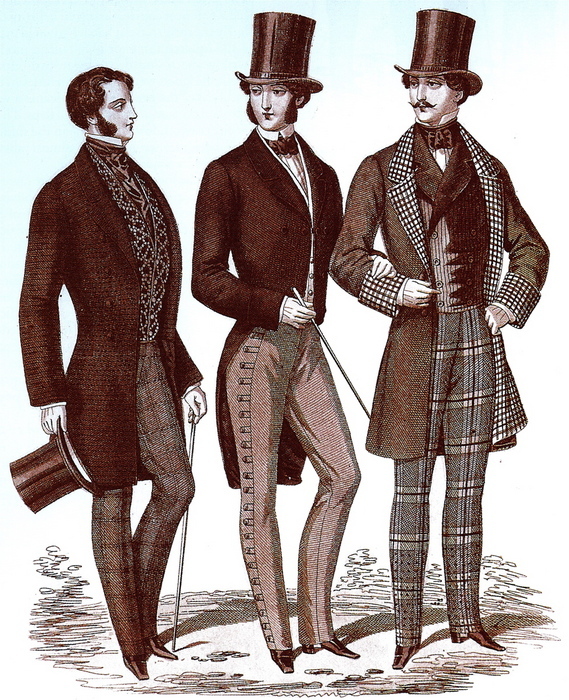 When it comes to men’s fashions,by the way, little changed through the century. A basic tailored coat, waistcoat, white shirt, trousers, shoes, and hat was what he wore for decades. But that top hat! My, my did that cause a stir or so they say. It is said that the first man to ever wear a top hat caused a woman to faint, a riot from some children, and a public fine for causing the stir. And who saved it all? Why, Prince Albert of course. (For those of you sick blokes out there, Prince Albert was a real person in this context not a painful albiet unique body piercing!) When he started wearing the top hat, history is history…until after the fifties and then, well…I don’t want to go into it! I cry when I speak of that! And now we’ve hit the bustle! Fabulousness at it’s finest! With the fullness bunched up to the back of the skirt creating a polonaise style, crinolines and cages suddenly disappeared evolving into bustles. The bustles supported accentuated drapes on the hips. Other top skirts were called aprons and they were also draped making the wearer look like a piece of glorified upholstery. Soon, ball gowns developed a train which later migrated to day wear. The sewing machine was now just a tool to apply more ostentation! 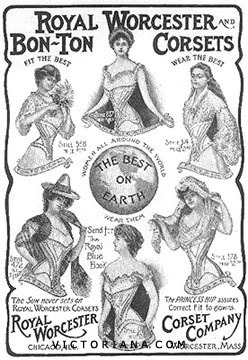 Sadly, by the 1880’s the soft bustle had all but disappeared. I say we bring it back! However, the cuirasse bodices were been getting longer and longer by this point so much so that it reached the thighs. It basically looked like a body wrapped in armor. This type of dress was exceptionally form fitting…much like armor. Hair became really elaborate, piled high on top of the head, with tons of ringlets, combs, pins, and ornaments. However, this fashion was really only flattering to the slim and those people who didn’t have to work hard labor. The fashion died out within three years! 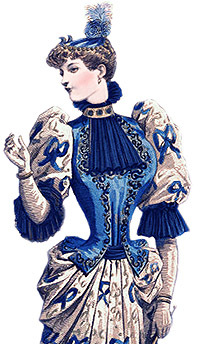 With women taking on more power and responsibilty in the home and work place during the end of the 1880’s, the “power suit” started coming into play. I compare it to the 1980’s when women started preferring men’s jackets and military styles over their daintiness. Tailored suits, however, were not for everyone as it still very much is today. Again, bright but deep colors were the way to go! Dark reds, peacock blues, sea green…all of which were mixed and matched horribly for everyday wear! But the evening colors were much softer though the style did not change. It was like the 60’s but without paislies! By the end of the century Queen Victoria’s influence over fashion was long gone. People who were in mourning still followed court guidelines on mourning dress which was both tedious and some say unnecessary. The real royal influence in fashion was the wife of the Prince of Wales, Princess Alexandra. At this point, fashion took on another turn and the 20th century began! 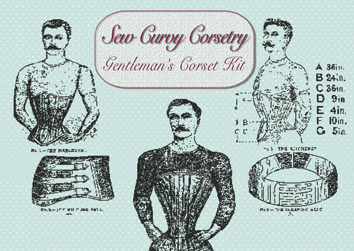 But again, I wish to emphasize the corset!